After the Thanksgiving feast (and some major splurging), are you looking for a healthy creative way to use that leftover turkey? Well look no further. Once you’ve fought the craziness of Black Friday shopping, throw together this Quinoa Turkey Salad, tossed in a refreshing Lemon Vinaigrette. 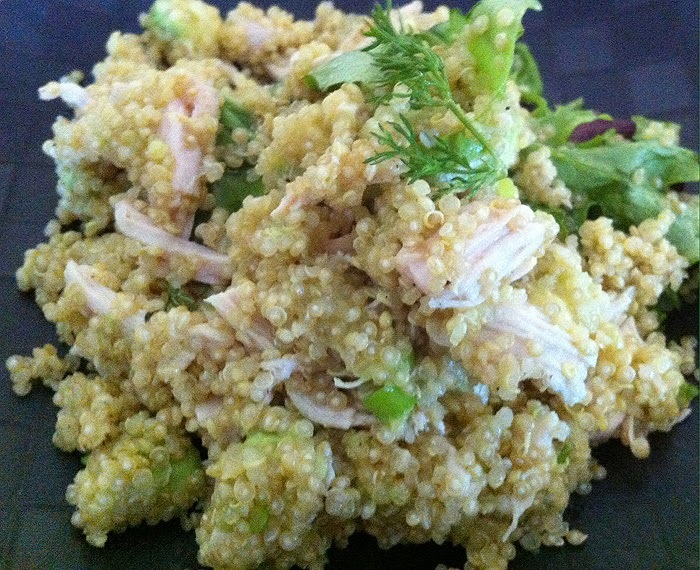 Quinoa is packed with protein, fiber, essential amino acids, and anti-inflammatory phytonutrients. Not to mention, it is also low-calorie and gluten-free. I’m slightly fascinated with quinoa, therefore, always looking for opportunities to incorporate this lovely little seed into my meals. So there you have it, an ingenious match for leftover turkey. This delicious salad is filled with healthy nutrients, a perfect addition to your Black Friday affair. Enjoy! Combine 1/2 cup quinoa with 1 cup water or broth in a pot. Bring to boil. Turn heat on low, cover, and cook for 15 minutes. Cool quinoa to room temperature. Place quinoa and all salad ingredients in bowl and toss with ½ cup salad dressing. Season as desired with sea salt and fresh ground black pepper. In blender, blend all ingredients until smooth and creamy. What a great way to use leftovers! Perfect, thank you. The lemon vinaigrette sounds lovely! Such a nice idea with the quinoa. Love the Lemon Vinaigrette. What a perfect post Turkey Day meal! There's only so many turkey sandwiches you can take! Love the lemon vinaigrette! My family has really been in quinoa recently. I'm saving this recipe to try! Looks delicious! This is a great idea. I love quinoa so this is a hit for me. Great way to use leftovers. Love, love, love quinoa. What a great way to repurpose Thanksgiving leftovers! Oh this looks like a nice switch up to the heavy, creamy leftovers I've been seeing. This is totally something my husband and I would love! Thanks for the great idea. Quinoa salads are my current obsession. I just love those protein packed little grains. This is an excellent way to repurpose leftover turkey. I LOVE the look of this salad. It's perfect for thanksgiving leftovers and love the addition of lemon. Now that's one fantastic way to use up Thanksgiving leftovers! Delicious idea, and welcome meal after the heavy holiday meal! That lemon vinagrette sounds perfect! I love that you are taking your turkey leftovers and giving it a whole new taste with a little lemon! It sounds so good!